One of the first names on Jürgen Klinsmann's USMNT teamsheet, Hertha Berlin defender John Anthony Brooks is fast becoming the impenetrable force of this summer's Copa America Centenario. Born in the German capital four years after the Berlin Wall came down, Brooks is the son of an American serviceman from Chicago. Signed by hometown club Hertha at the age of 18, Brooks' early promise was nearly derailed in April 2014 when he elected to get a large-scale tattoo on his back mid-season. Brooks has gone from strength to strength since. The 23-year-old now has three goals from central defence in his 24 international caps, and the first of those was what really put him on the map for fans not already familiar with his domestic exploits. Leading Ghana 1-0 thanks to Clint Dempsey's well-taken first-minute opener, Klinsmann sent Brooks on at half-time of the USA's first Group G game at the 2014 FIFA World Cup to help defend that advantage. 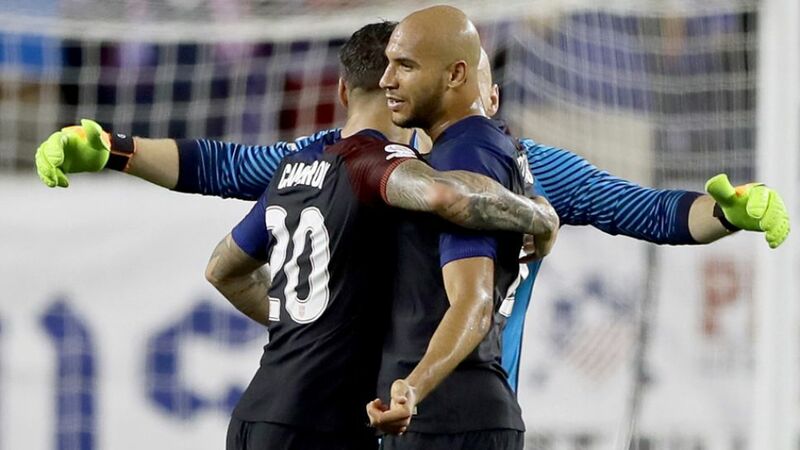 The Americans held firm for the next 40 minutes, only for Andre Ayew to restore parity with eight minutes to go - cue Brooks' chance to shine at the other end. Graham Zuzi sent a corner into the box four minutes later and Brooks rose highest to power home the winner. It was quite literally a dream come true for the youngster. The goal also made Brooks the first American substitute to score a goal in 84 years of World Cup history, and his Wikipedia page was edited by fans soon after, who described him, rather tongue in cheek, as "the greatest American since Abraham Lincoln." Brooks has never actually lived in the United States, and, like his current USMNT teammates Fabian Johnson and Jermaine Jones, has represented Germany at youth level. That familiarity with German football has helped Brooks blossom into a feared Bundesliga defender, though. Brooks retains an affinity for tattoos - he now has images of Berlin and Illinois on either elbow - but with a new-found maturity and an ever-improving effectiveness in either box, perhaps the next time ink is required for the centre-back will be in the annals of US soccer history, with a first Copa America triumph looking increasingly possible for the USMNT.